After 12 hours of dizzying landscapes I hardly have a single word left in my brain, and I think at this point in the trip that's a good thing! Spinning out the window all around us was the vast Icelandic countryside with its utterly dizzying variety: lunar landscapes one moment, then fertile, vibrant green fields with sheep agraze, then light green moss-covered lava fields, huge mountains draped in fog, rushing glacial rivers, a sudden torrential downpour, a break of sunlight, white caps on the distant ocean. It feels like we’ve been in seven countries at least in this one day! It seems like we passed one of these dramatic waterfalls about every five minutes! At the reading I did last night, a young Icelandic woman came up to me. “I think we might be related,” she said. “My mother sent me here tonight to see if you can help us find our relatives in America.” I looked at the names at the top of her genealogy and none seemed familiar—and then suddenly I saw the name of my dear American cousin Sigrid Rafael, who is related to me through both my grandmother and grandfather’s sides of the family. 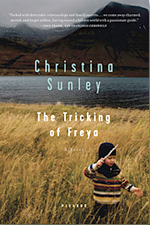 While I was writing The Tricking of Freya, my mother kept saying, "You better finish soon, or Sigrid might die before she gets a chance to read it.” In the end, it was my mother who died before having a chance to read it. Sigrid was blind by the time I finished, but her daughter, my cousin Diana, read the entire manuscript out loud to her before she died. So now I can help this young Icelandic woman who came to my reading in Reykjavik find her American relatives, including me. I just need to refer to our family Blue Book (a geanealogy tome which appears in my novel), that Sigrid researched for years, and has all the family going back to 19th century Iceland and forwardto the end of 20th century North America. But back to today… unfortunately I fell asleep and caused us to miss the turnoff to the volcano, waking up an hour too late to go back. But the truth is, it is now slumbering and we’ve been told there’s nothing to see right now. Yet we did drive through “ashlands,” farmlands covered in ash, a fine black silt. I wore a mask as we drove through, since I’ve only just gotten over pneumonia. The town of Vik, sparkling clean after its recent cleanup from the eruption. We had lunch in the little seaside village of Vik, which we’d heard had been devastated by ashfall. Strangely, it looked clean and sparkling…? The young woman at the museum told us the government had just hired a crew of over a hundred people to shovel out all the ash and hose down all the streets and buildings. In a way I regret missing the active eruption, which died down just before we left, but could wake up at any moment. But just seeing the ashfall gave me a sense of what my grandfather and his family went through when Askja erupted in the East of Iceland in 1875. The morning sky was so black with ash he couldn’t see his hand in front of his face. Last night I had dinner with a woman, a Lithuanian immigrant to Iceland, who got caught in a terrible ashstorm while trying to see the volcano. It was a complete blackout, stuck on the road unable to even turn around, returning home with ash gritting between her teeth. We finally arrived at our destination, a farm guesthouse called Brunholl where I stayed once 12 years ago, only to be greeted with a message that we had left an entire suitcase in Reykjavik! At first Oliver and I blamed each other, but now we are each insisting on taking the responsibility. The truth is that our schedule was so hectic and we were so exhausted it’s amazing we managed to get out of town at all. My dear cousin Hrefna to the rescue – she will put the suitcase (all of Oliver’s clothes) on a domestic flight tomorrow and we’ll pick it up in Egilsstadir on our way to Seydisfjordur. The farm’s declicious homemade licorice ice cream made everything OK again. You can visit their cows in the cowshed, or just watch them on a web cam in the lobby! I feel like I've hardly spent a moment outside in Reykjavik... or rather, just a few minutes, here and there. The pace has been so relentless, between book events, media interviews, and visiting relatives...I'd forgotten how grueling book touring can be. Just leaves me with a longing to come back and spend an entire week just walking around the city day and night. With a lot of help from a lot of people, we've gotten some great media coverage, and hence really good attendance at events. I've talked to so many people at the events: people who have read the book, people who think that we might be related (and usually we are), people who have stories to tell... I've made so many great new contacts, with writers and scholars and readers and frændfolk (relatives). Oliver has totally mastered navigating Reykjavik, along with suddenly having an amazing Icelandic accent that is making me quite jealous! Plus he's taking tons of photos, but we're on the move all the time and there's hardly time to download them. Our hosts in Reykjavik have been my cousin Hrefna, her husband Eirikur, and their 20 year old daughter Hallveig, who just graduated from Mentaskol. They had a big graduation party the day after we arrived, and held a dinner party for us a couple of days later. Endless Icelandic hospitality! Hrefna is a historian and works at the National Archives. Happy graduation Hallveig! Eirikur carves lamb roast smothered in blueberries. Today we woke with our car covered in ash. And now out of nowhere a sudden intense rainstorm which hopefully will wash it away; the ash seems to be covering everything in a fine layer of brown sand. Wonderful breakfast party at the home of one of my relatives, Anna Thora. She hosted me here in this home for a month while I was attempting to learn Icelandic in 2000. Bread, cheeses, and luckous cake made of Icelandic Skyr and cherries.